Many regions in Indonesia have wide areas, but not all of them have many tourists object. Cilacap is one of the largest regency in Central Java Province. But, the name Nusa Kambangan Prison makes Cilacap has bad image as prisoner place whereas, there is an area called Segara Anakan, a wide mangrove forest, a place to take a marine biology adventure. Segara Anakan is a lagoon with 40,000 Ha wide at South Java beach. 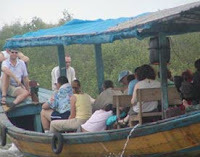 Not only mangrove forest, but also the diversity of flora, fauna, caves, and the living place for mysterious creatures available and very attractive. Sleko Port is the main gate to enter the Segara Anakan tourist area. Segara Anakan was located at the back of Nusa Kambangan Island. To reach this place, you can utilize small boat or compreng, only costs Rp 50,000 – 100,000/man. It’s about three hours journey from upper course to lower course. You can see mangrove forest after entering the small river. Here you must slow the speed to avoid the crushing with the mangrove tree. 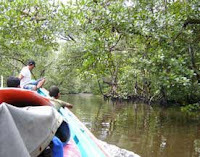 Mangrove forest wide range is about 9000 Ha. Fishermen often cross this area to bring their catch. The original Segara Anakan citizen is very hard to find fresh water and fuel. So, they bring many drums filled with fresh water and fuel which they bought in Cilacap. In this area, the atmosphere is so alive with the kuntul’s birdling. There is a fruit which believe as a living place for mysterious creatures. Segara Anakan area still well protected against human kind even only small area (about 1200 Ha). Slowly, the mangrove forest starts to ran out, whether naturally (coz by the shallow process) or human deed (chop the mangrove wood). We need hard work to safe this area. It’s not describes since when fisherman settle exist. This was the settle for the aborigines. This area also well known as Kampung Laut, pretty hard to reach coz the location is quite cloistered. We move closer to Kampung Laut, ujung Aru. It was like a remote place, so quite. There are 3 villages here. People here consider Segara Anakan like couple beloved which can not be separate with Kampung Laut. People here very depend on the lagoon coz there was their resource. We met one of the citizen, her name is Yani. She lives with her son, Ujang. Their really depend on mangrove crab in this area. They start to collect in the morning then count it at night. They sell their catch to big city such as Semarang and Jakarta. It’s about Rp 40,000-50,000/kg. The prize will increase twice if we eat it at the restaurant. Kampung Laut’s dead or life really depends on the mangrove crab. They wish the prize will raise up at the market. The problem is, they don’t know until when these crabs will whelped while Segara Anakan region getting threatened. Kampung Laut is not the end of the Segara Anakan story. For some people who ever came to this place , part of this area was surrounded by magic and mysterious things. 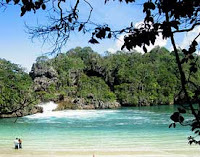 There is also a cave, called Masigitsela cave, located at the hillside Nusakambangan island.